Before joining more than 1,000 people gathered to bid farewell to their husband, father, and friend, family and friends of fallen California Highway Patrolman Saul Martinez met Privately with Governor Pete Wilson for what proved to be an emotional moment. Wilson addressed the approximately 40 people gathered in the room adjacent to the main chapel at Our Lady of Perpetual Help Catholic Church, then presented the California Medal of Valor to Martinez’s wife, Remedios Martinez. “The medal is an award to Saul for the courage he gave in sacrificing his own life to save his partner, Donovan Rice,” Wilson told those gathered. The medal which was awarded to the seven-year veteran, is the highest honor California bestows on state employees. Farm workers in straw hats, the governor, and a huge gathering of law enforcement officers standing teary-eyed, gathered Monday, May 19, to pay tribute to Martinez, who gave his life to save his partner. More than 2,500 mourners attended services at the Our Lady of Perpetual Help Catholic Church in Indio, where Martinez attended Mass each Sunday, and onto the street outside. Friends and colleagues stood in the stifling heat listening to the funeral Mass on loudspeakers. “What he did as his last act on Earth was a sign of how he always lived,” Father Rafael Partida told the gathering. Martinez, 39, and a father of three, died May 16, just over a week after he pushed partner Donovan Rice to safety and left himself in the path of an oncoming car on a pitch-black desert highway. Martinez and Rice stopped about 1 a.m. to investigate a car parked along Dillon Road, a wide, empty highway in the desert north of Palm Springs. From behind them in the desert night, a car was barreling down on the officers, traveling along the shoulder of the highway, more than 15 feet off the roadway, investigators said. “I heard the sound of crunching gravel and Saul yelled, ‘Run!’ But at that point, everything went into slow motion for me, and Saul pushed me, slammed me, out of the way.” Rice said. “When I hit the ground, I looked up and I saw the headlights and I knew I was going to die,” Rice said. But the oncoming car hit the parked vehicle and in the twisting, spinning crash, Rice was struck on the thought he might be dead. I was crying uncontrollably.” Martinez was run over by the car, dragged about 15 feet and pinned beneath it. Rice, who couldn’t stand up, ordered the driver, identified by the CHP as Joseph La Pagila, 63, to use his CHP radio to call for help. A CHP dispatcher in Indio heard an unfamiliar voice calling out, “Hello? Hello!” La Pagila reported that he had run over an officer, said CHP Sgt. Bill Dato. Within moments, a Riverside County deputy sheriff arrived on the scene, checked Martinez, still trapped beneath the vehicle, for vital signs and felt no pulse. The next call then went out on the radio was, “11-44.” Meaning an officer is dead. Local police, sheriff’s deputies and CHP officers from miles around converged on the scene and lifted La Pagila’s car off Martinez so paramedics could pull him out and treat him. Rice was treated for minor leg injuries and released from the hospital for a three-day bed rest at home. Rice, who had recently become Martinez’s partner, said the two enjoyed teasing each other and that he learned to respect Martinez’s devotion to family. Such remarks were echoed all around Indio where Martinez was a fixture at his three children’s schools. Martinez, who was born in Via Juarez San Luis, Potosi, Mexico, emigrated with his family to the United States in 1964. He graduated from Buena High School in 1977 before attending the University of California at Santa Barbara for two years before he was hired by the United Farm Workers, where he worked with Ceazar Chavez for almost 10 years as a community leader and activist. Martinez started as a translator, was promoted to organizer, and then to contract negotiator. His final position with the UFW was crop manager. In this position, he was in charge of all matters related to the grape crop throughout California. He received numerous awards from Chavez for his work for human rights. 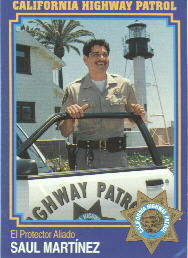 In 1987 Martinez left his position with the UFW to work as a dispatcher for the Delano Police Department. A year later he transferred to the Indio Police Department as a dispatcher. After three months as a dispatcher in Indio, he was offered and appointment to the CHP Academy. 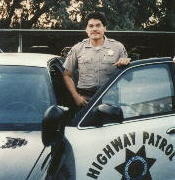 Cadet Martinez began his training in Sacramento on December 10, 1988 and on May 12, 1989, he was assigned to the Indio CHP area. Martinez’s 12-year-old son, Saul Jr., and his two brothers, Ben, 20, and Rafael, 29, received the Latino Peace Officer of the Year for 1996 award May 10, on Martinez’s behalf as he lay critically injured in the hospital. The award was presented by the Latino Peace Officers Association of Riverside and San Bernardino counties. Rafael Martinez, a Ventura police officer, described Saul as a “peace maker” and someone the entire family counted on. “I consider Saul a leader among the leaders,” he said. Martinez joined the proactive El Protector program seven years ago and made immediate impacts. The program targets the Hispanic community, educating the people on traffic safety. “Saul spent hours, not just department time, but months worth of hours on his own in those communities,” CHP Public Information Officer Tammi Low said. “He is definitely an individual who believes in his community. Martinez is survived by his wife, Remedios, son, Saul Jr., 12, and daughters, Catalina, 6, and Elizabeth, 14. A Martinez Family Trust Fund has been established. Donations ca be made to account no. 045103668 at First Community Bank, 74-750 highway 111, Indian Wells, CA 92210.